Turquois Fish Restaurant - iGotAppetite! ​Got Appetite? 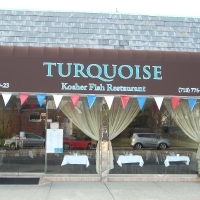 This Kosher Fish Restaurant serves the finest and freshest fish, delivered daily. Featuring Kosher Dairy, the restaurant also serves hand cut salads made to order as well as whole fish, raw fish specialities, and a Sushi Bar that is not to be missed. Order from a selection of the finest Kosher and Mevushal wines available as you dine in this casual and comfortable, family-friendly restaurant. Kosher supervision by the Vaad of Queens. Turquoise serves Cholov Yisroel, Kemach Yoshon. Mashgiach on premises all times. Got Appetite? Get 10% OFF INSTANT REBATE! This iREBATE is only valid with a confirmed iGotAppetite.com online reservation. It cannot be used in conjunction with or combined with any other discounts, promotions, or gift certificates. Valid only with an online reservation via iGotAppetite.com. All guests must be present and seated before 5:25pm. This combined SPECIAL cannot be used in conjunction with or combined with any other discount, promotion, or gift certificate.